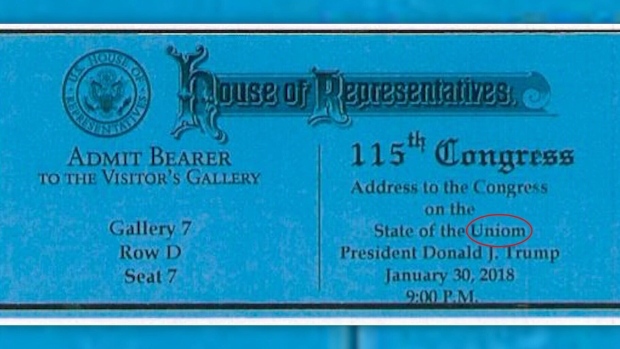 A typo is seen on the ticket for U.S. President Trump's State of the Union address. WASHINGTON -- Tickets inviting guests to U.S. President Donald Trump's first official State of the Union address Tuesday had to be reissued after a misprint. 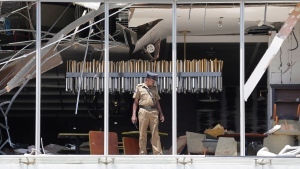 The tickets read, "Address to the Congress on the State of the Uniom." Lawmakers had fun with the glitch: "Looking forward to tomorrow's State of the Uniom," Sen. Marco Rubio of Florida tweeted with a picture of the invite. Rep. Raul Grijalva of Arizona used the glitch to jab at the secretary of education: "Just received my ticket for the State of the Union. Looks like ΓåòBetsyDeVosEd was in charge of spell checking... .SOTUniom"